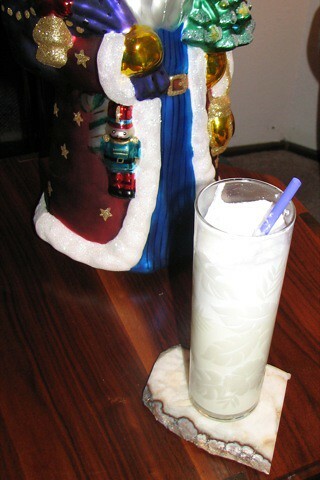 This is one of those recipes with many names (the Ramos Fizz, the New Orleans Fizz and so on). The cocktail originate from one Henry Ramos, owner of the Imperial Cabinet Saloon in New Orleans around the turn of the last century. The recipe also varies a bit (the one I chose was from Gary Regan’s the Joy of Mixology) but all seem to be subtle variations in the amount of the ingredients above. Now before you take this opportunity for a serious cocktail meltdown, yes that does say an egg white. This was at one time a common technique to give a cocktail body. The pisco sour, which I intend to write about also uses one. And no, salmonella is NOT the inevitable outcome of this drink. Remember, 1) contracting salmonella from eggs is rare at best (think raw cookie dough) and 2) salmonella isn’t fond of the acid from the citrus and the alcholol from the gin. If you still aren’t convinced, try pasturized egg whites. As a final note, orange blossom water can be found at any middle easter grocery or in the international isle of most better grocery stores (at least in California). It’s a floral scented water like rose water and lends a perfumy complexity to the drink. Go easy on this ingredient or its all you will taste. So, you’re still with me? Okay, here’s what you do. Add everything above except the seltzer to a cocktail shaker with some ice cubes. Sake viciously (30 seconds and hard). Strain into a tall collins glass with fresh ice. The drink should be think and creamy at this. Top up with seltzer. Decorating for Christmas is optional. In spite of everyting, this really is a tasty, refreshing drink that is well suited to summer. Enjoy.